America Revealed: World Gripped By Anti-Government Riots; America Next? 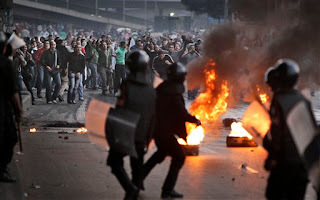 World Gripped By Anti-Government Riots; America Next? The planet is in a never-ending cycle of anti-government revolt as riots that plagued Europe last year now spread like wildfire through the Middle East and beyond, threatening to accelerate bloody clashes and force the hand of authorities as the risk of a new Tiananmen Square-style massacre grows ever likelier. Is America next in line to experience unrest that has touched almost every corner of the globe? Our prediction three years ago, based on UN documents, which was made six months before the collapse of Lehman brothers, that the world would be hit by massive food riots and anti-government unrest in the aftermath of an economic collapse, is now unfolding at an astonishing pace. The latest countries to be enveloped by the chaos are Tunisia, Egypt, and now Yemen, whose population are demanding the ouster of 30-year President Ali Abdullah Saleh in a protest against poverty and lack of political freedom. The unrest in Yemen was inspired by a popular uprising in Tunisia earlier this month that led to the ejection of President Zine al-Abidine Ben Ali, figurehead of a government accused of abusing their power to enrich themselves while the poverty gripped the rest of the country. Ben Ali was forced to flee the country and the interim government has now issued an international arrest warrant for the President and his wife. Riots in Tunisia were quickly followed by mass protests in Egypt demanding an end to President Mubarek’s regime. Four people have died as demonstrators engaged in violent clashes with police and set fire to government buildings. Besides America there has barely been an area of the globe that hasn’t been hit by riots and unrest in the last six months, as the fallout from the economic collapse begins to be felt amongst the victims of the financial terrorists that launched an assault characterized by falling wages, high unemployment, spiraling inflation and food prices as well as crippling austerity cuts. The cost of staples like wheat, corn and soybeans is going through the roof as countries increasingly rely on imports from the U.S. to offset the impact of global unrest. Back in early 2008, before the collapse of Lehman Brothers and the start of the financial crisis, we warned that inflation and economic uncertainty would cause inflation to skyrocket and food prices to explode, which would lead to riots globally. That “age of rage” is now playing out across the planet, with governments being toppled left, right and center as economic turmoil forces desperate people to revolt in a bid to rescue any kind of decent living standard. We didn’t have the privilege of a crystal ball when we made these predictions, we were merely reading what globalist bodies and the elite themselves were saying would be the consequences of their agenda to eviscerate any kind of middle class and re-impose an archaic caste system of haves and have nots. The only question left to be answered is if and when similar scenes will unfold on the streets of America, as notoriously accurate trend forecaster Gerald Celente warned would happen several years ago. Celente put the time frame on “tax rebellions and food riots” sweeping the US by 2012. With even the likes of Time Magazine seriously entertaining the probability of social dislocation as a backlash to the crumbling economy leading to “civil war” in the United States, we stand on the precipice of bedlam. If the violent scenes we now witness unfolding across the planet are anything to go by, we won’t have to wait too long to find out whether or not the United States will become engulfed in the crisis, or whether the global elite will move to prevent such a scenario by coming to the realization that their war on the middle class and the poor threatens to provoke a reaction that even they may be unprepared to deal with.